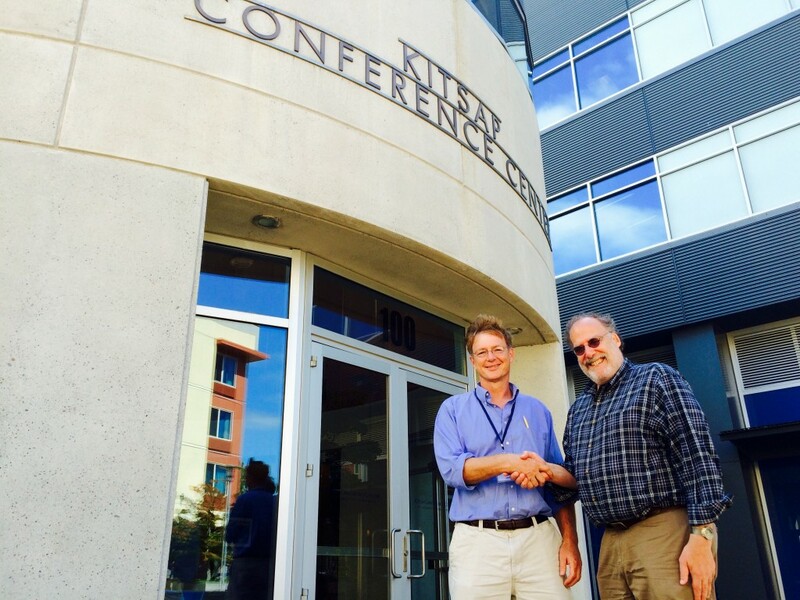 Bob Abel (left) and Steve Kahn at the Kitsap Conference Center Thursday. Steve Kahn often gets one question about the Large Synoptic Survey Telescope, due to start mapping the Heavens in 2022. “Haven’t we already done that?” people say. The truth is that such stellar cartography has never been done on this scale before. It’s truly a game-changer, Kahn says. “The answer to that question is that the sky’s a really big place,” he quips. And it needs a really big telescope to map it. For example: The mirror on the Hubble Space Telescope is 2.1 meters across. By contrast, the LSST’s will be 8.4 meters. The teams working on the largest federal project in astronomy today — $665 million to construct a mammoth telescope, build the biggest ever camera for it and capture unprecedented amounts of data — have been right here in Bremerton all week, advancing their cause. Kahn, who is the director of LSST and a Stanford University professor, is no stranger to big projects, having worked on massive x-ray telescopes and particle accelerators at the Stanford Linear Accelerator Center (SLAC). But LSST is different in at least one regard: the scientists building all of its parts are scattered throughout the country. “Most big projects are built by one team and are in one place,” he said. And despite a world with so much connectivity via the Internet and video conferencing, there’s just no substitute for face to face interaction. Kahn wants to ensure that the telescope builders, camera constructors, data keepers and other scientists don’t bifurcate into fiefdoms but that they’re all working toward the same unified goal. “We want LSST to not only be a great telescope and great for science, but also to be a great team,” he said. That’s where Bremerton comes in, the city Olympic College Professor Bob Abel — also a part of LSST — was able to convince his colleagues to come to for an “all hands on deck” weeklong meeting. This week has been productive in solving a particularly thorny issue facing LSST: how best to map the cosmos. Kahn refers to the “traveling salesman” problem: what’s the route to take to make the most sales and drive the least amount of miles possible? Kahn says the LSST will focus on four main areas: near Earth objects, to see what asteroids might imperil Earth; the science of the Milky Way, to include a first ever 3-D map of it; examining a changing sky, which includes supernovae and the like; and potentially solve some fundamental mysteries, such as learning more about dark energy. But for the week in Bremerton, Kahn also wanted to build camaraderie. Abel took the charge of bringing the scientists in to the community: playing soccer each morning at Kiwanis Park and hosting talks all week long at SEEFilm Cinemas and around town. Kahn has been amazed at the some 1,000 people who’ve come out to hear from some of astronomy’s brightest minds. They’re not just asking “surface questions” and show an understanding and curiosity that’s impressed the director. He wonders if even his hometown of Palo Alto would draw that kind of response.